We always have ice cream at my house. My husband’s favorite kind is vanilla, and I like some chocolate and cookies mixed into my ice cream. These Mint Chocolate Chip Greek Yogurt Pops are a healthy compromise, with less sugar than ice cream and an extra scoop of protein. I have Greek yogurt as a snack every day at work. I choose Greek yogurt because it’s high in protein, averaging twice as much as traditional yogurt. It keeps me full all morning until lunchtime rolls around! I use creamy vanilla Greek yogurt and milk in these easy pops — it’s the tastiest double-dose of dairy you’ll get all day! 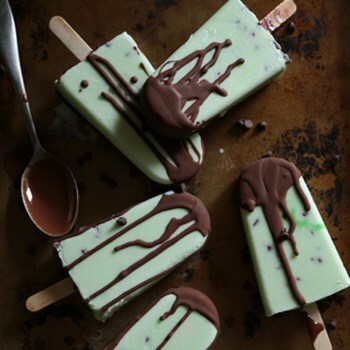 These minty green pops are a cool dessert on a hot summer day, a sweet afternoon treat or a healthier dessert option little kids and big kids alike will love. Keep your freezer stocked because once you try a pop, you won’t be able to stop! Add in green coloring to your desired shade of green. Whisk it into the mixture until it's evenly mixed in. Pour the mixture into a popsicle mold. Sprinkle the tops of the pops with the mini chocolate chips, some will settle through while the pops freeze. If you would like additional chips mixed in, mix in a few additional mini chocolate chips using the popsicle sticks. Place sticks in the pops to freeze. This recipe originally appeared on Country Cleaver. Desk jockey by day, mad baker, and ravenous eater by night – and dreaming of a country life every moment in between – Megan started Country Cleaver as a place to test out newly-baked creations from her kitchen and share them with the world. 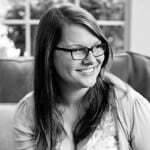 Megan currently lives in Seattle with her husband and her Yellow Lab, Huckleberry. And they hope to return to their country roots in the wheatfields of Washington State soon. Just wanted to say…these were flippin’ AWESOME!! Thank you for posting this recipe! !